Mars Express image - Solar System Planets And Moons Section. 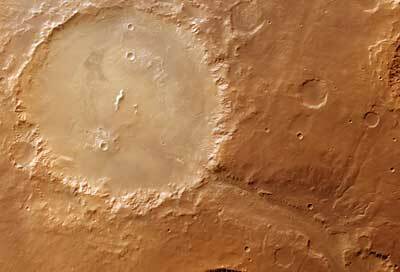 Mars Express took this image of 140-km. Deployment of Second MARSIS Boom Delayed. Controllers with the European Space Agency have deployed the first of Mars Express' MARSIS radar booms. During the operation, however, they detected an anomaly with one of the 13 segments that make up the telescoping boom - segment 10 hasn't fully locked into place. Controllers are going to hold off extending the second boom until they can figure out what's happening with the first. Once fully deployed, the MARSIS radar will allow Mars Express to map the subsurface of the Red Planet, searching for underground reservoirs of water. Saturn's Moon Phoebe might have arrived at the planet after a long journey from the outer Solar System, according to new research from NASA. When Cassini analyzed the heavily cratered Moon in June 2004, it found that it was ice rich, but covered with a thin layer of darker material. This is a similar composition to Pluto and the Kuiper belt Objects. Phoebe likely started further out, but then was redirected towards the inner solar system through interactions with other objects. Finally, it was captured by Saturn into a stable orbit.